Is the loved one in your life OBSESSED with Impractical Jokers?! There's some friggin' awesome merch to be found on the internet - and we've rounded up ALL the coolest stuff just for them (and your parents. And your baby. And your boss. And then you again). Happy Christmas everybody! Joe was also best mates with Frank Sinatra in a past life. Sal's T-shirt (with reference to the Confederate flag, a controversial subject at the time of broadcast) was blurred out in the episode in which they visited Texas. This is what it said. The Jokers got a mention in a Marvel comic earlier this year. X-Man Archangel is on his latest adventure and at one point, villian Zorn expresses his TV-watching preferences... which includes our favourite pranksters! Joe has a twin. It's uncanny. Apart from the sperm donation part, obv (we guess). The internet thinks this might be the weirdest IJ extra ever. He said to Murr, who was carrying a protest sign asking for his restraining order to be lifted, "I've been in vaguely similar circumstances" involving "a Macedonian". Eeek. 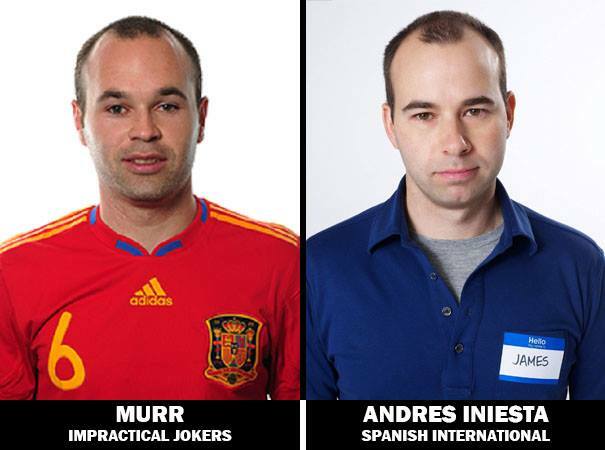 Murr actually made a surprise cameo in the Belgian version of Impractical Jokers. Ik zie u graag!